Dubai, UAE, January 03, 2019: Cleansing is one of the most important steps in any skincare regime, as airborne bacteria, pollution and make-up sit on our skin for long hours and can cause major skin issues if not removed effectively. 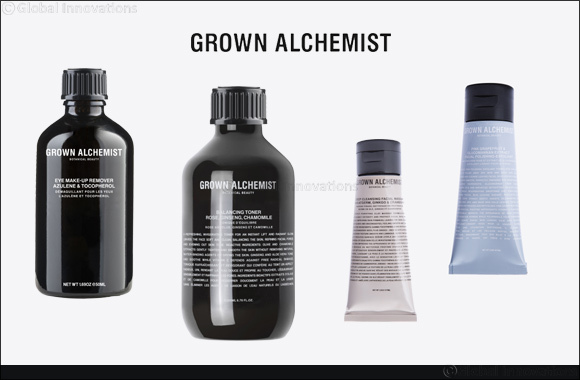 Grown Alchemist skin experts recommend two different cleansing techniques, the single cleanse and double cleanse, to ensure all the dirt and grime has been effectively removed. With that in mind, these methods should be used at different times during the day for maximise the benefits of the cleansing process and make it more efficient. Double Cleanse: This cleansing technique involves using two different cleansing products, the first one is usually an oil-based cleanser to breakdown make-up and sunscreen. The second step however, is a water-soluble cream or gel according to your skin type, to eliminate toxins and leave your skin refreshed and treated – ready to treat with your prescribed skincare system. It is recommended to double cleanse in the evening, especially if you wear make-up and sunscreen for long hours during the day. This will help to emulsify make-up and then remove excess cellular waste, pollution and skin secretions. Single Cleanse: This method involves a water-soluble gel or cream cleanser and it's recommended to use this technique in the morning, as during the night the skin regenerates itself and releases toxins and waste. Hence, it's extremely important to use a gel or cream cleanser in the morning to eliminate these toxins - which can cause congestion, aging and stress the skin if left on the skin. Here are a few products from Grown Alchemist, which also include an exfoliant and cleansing mask that can be integrated into your cleansing routine for best results. This highly effective natural, solvent-free, dual-activated formulation dissolves and removes waterproof make-up without causing dryness, while detoxing and noticeably protecting sensitive facial skin around the eyes from premature aging. It contains chamomile to soothe and calm the eye area. This product is perfect as first cleanser in the double cleansing method and it's not required if you're going for a single cleanse. A gentle skin-polishing exfoliant formulated for daily use, to gently delaminate dry and dead skin cells and stimulate cell regeneration. Only use a small amount of product, no more than a pearl-sized amount and massage on a cleansed, damp face. Using a light touch, gently massage all over the face and neck, avoiding the eye contour area. Add water as necessary, to maintain a flowing texture. Massage for no more than 30-60 seconds on each area and then rinse. This step doesn't need to be performed more than twice a week. This deep cleansing clay masque is formulated to detoxify the skin while noticeably improving its firmness, leaving it visibly decongested and feeling smooth, toned and prepared for moisturising. Masques are ideally used after exfoliation, as together they create a powerful synergy and the leave the skin feeling softer and smoother. This refreshing and invigorating toner instantly lifts and gives the skin a radiant glow. Leaves the face soft and clean, balancing the skin, refining facial pores and evening out skin tone. It contains olive and chamomile extracts to gently tighten and smooth the skin, without removing natural water-binding agents or drying the skin. It also contains ginseng and Aloe Vera to tone and soothe, while Vitamin C defends against free-radical damage. This toner is safe enough to be used around the eye contour, it's the last step in cleansing and first step in hydration.